As we get older, we tend to experience more health concerns than we did when we were younger. Our dental health is no different. At my Douglasville dental office, we want all of our patients to be aware of some of the most common oral health issues that tend to affect those 50 or older. All of these common oral health concerns can eventually lead to tooth loss or more serious issues if not treated. To help avoid them, see your Douglasville dentist at least twice a year for regular dental check ups and cleanings. If you’re concerned about any dental issues at any age, we encourage you to call my Douglasville dental office to schedule an appointment. We’ll discuss your concerns and determine the best treatment options to help you keep your teeth for a long time. 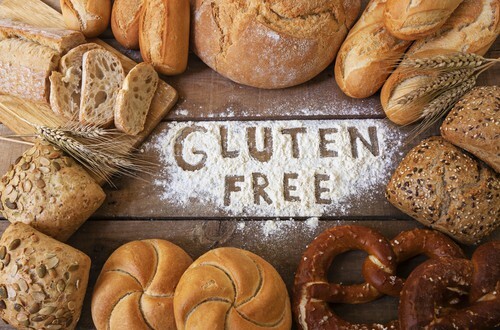 Eating gluten-free has been increasing in popularity over the past couple of years. Sometimes this dietary change is due to choice. Other times, it’s out of necessity. Those with celiac disease or a gluten intolerance avoid gluten because it makes them incredibly sick. In these individuals, gluten can also cause irreversible tooth damage and other serious oral health concerns. Gluten is used to describe the proteins found in wheat, rye, and barley. These proteins act like a glue that allows foods to maintain their shape. Many foods contain gluten, even some that may be surprising like some condiments. What Oral Health Problems Does Gluten Cause in Patients with Celiac Disease? When someone who is hypersensitive to gluten is exposed to it, they can become very sick. Usually symptoms of celiac disease are found in the gastrointestinal tract, but all parts of the digestive system, including the mouth, can be affected. It’s important to note that gluten itself doesn’t affect individuals without celiac disease the same way it does those who do have it. Seek medical advice before making any significant changes to your diet. At my Douglasville dental office, we support any diet that makes you feel healthy, including if you choose to eat gluten-free. For our patients that do have celiac disease, we encourage you to avoid gluten, not only for your oral health, but for your overall health as well. If your teeth have suffered enamel loss or you’re at risk for losing your teeth, whether caused by celiac disease or not, there are ways to help. Schedule a visit with your dentist in Douglasville to discuss your options, which may include dental implants, restorative dentistry options, or cosmetic dentistry treatment. Accepting patients from Douglasville, Lithia Springs, Villa Rica and beyond.